Notre-Dame Cathedral also known as the Notre-Dame de Paris went up in a blazing flame on Monday, April 15. In a roaring fire that began through the roof, firefighters tried their best to contain the blaze. As per the early morning updates, the fire was under control. The main roof has collapsed as the fire continued to blaze for eight hours. French President Macron is treating the fire as a national emergency. Pictures and videos of the devastation were widely shared on social media. 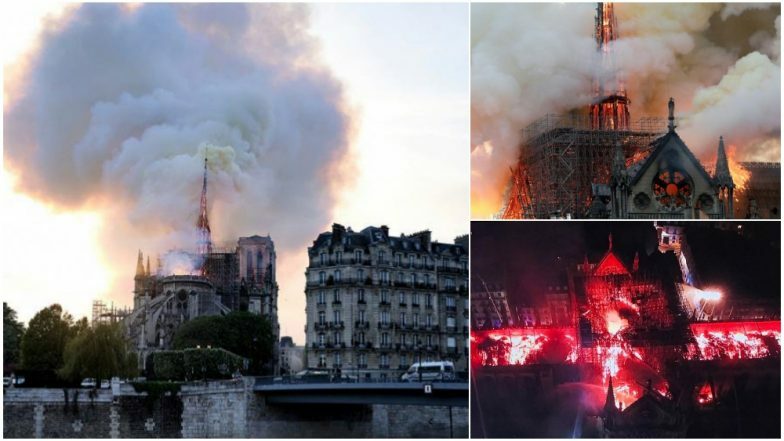 Paris fire brigade chief Jean-Claude Gallet said, "We can consider that the main structure of Notre-Dame has been saved and preserved" as well as the two towers. People expressed their shock and sadness to see the Parisian structure's destruction. Just days before Easter Sunday, the cathedral went up in flames. According to the fire services, the cause of this blaze could be linked to the ongoing renovations here. Around 400 firefighters battled throughout the night to control the flames that engulfed a part of the historical structure. There are numerous pictures and videos of the cathedral that have been shared on social media. People who have visited this place have also posted beautiful pictures of the structure and expressed sadness that the place turned to ashes. Notre-Dame de Paris (Our Lady of Paris) was considered as one of the finest examples of French Gothic architecture that was built since 1163. The structure was completed in the year 1345, making it one among the oldest Cathedral in the world. The place has seen many historic moments including war, the liberation of Paris and is a part of Paris in ways more than one. In 1804, the cathedral was the site where the Coronation of Napoleon I as Emperor of France. The iconic spire was added to the Cathedral supervised by Eugène Viollet-le-Duc. The building has also survived the devastation of two global conflicts in the 20th century. The famous bells rang on August 24, 1944, the day of the Liberation of Paris from German occupation at the end of World War II. The two towers which have been saved are sixty-nine metres high and were the tallest structures in Paris until the completion of the Eiffel Tower in 1889. The Cathedral celebrated its 850th anniversary in the year 2013. And for years, it has been a widely-recognized symbol of Paris and one of the greatest place of the French nation. One of the firemen was seriously injured. The Cathedral was in the midst of renovations currently and some scaffolding work was undertaken last week. It is said that this very reason could have prompted an accidental fire in the city's most iconic building.